Many thanks to Pet Friends Magazine for the spotlight on our brand new coalition! Read all about it in their latest issue! 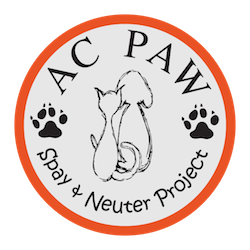 The newly created “No Unwanted Pets: Spay/Neuter Coalition of Grand Traverse Area” was formed by AC PAW and HANDDS to the Rescue. These two organizations have distinct, yet similar missions. AC PAW has a goal of helping homeless dogs and cats through rescuing these animals, fostering them in homes, and adopting them to forever homes. HANDDS (Helping Abused, Neglected, Disabled, and Displaced Souls) is dedicated to saving those dogs that would otherwise be euthanized due to lack of space, medical conditions, or severe injuries. One common mission of both groups is the promotion of spay and neuter; thus the formation of the No Unwanted Pets: Spay/Neuter Coalition of Grand Traverse Area. United together, the mission of this Coalition is to reduce the pain and suffering of dogs and cats caused by the devastating over-population problem in the Grand Traverse area. For more news from Pet Friends Magazine, please head over to their website.